So even though I’d like to, unfortunately I can’t permanently move in to the luxurious Davenport Hotel. But, I can take a little bit of the glamour home with me. Nestled off the Davenport Hotel lobby is The Signature Collection Store, where one can indulge in fabulous bedding, bath, stationery, furnishings and accessories. A night stay at The Davenport is like a try-it-before-you buy-it, as The Signature Store carries the quality I expect, as well as, items selected for the guest rooms in both the main hotel and tower. 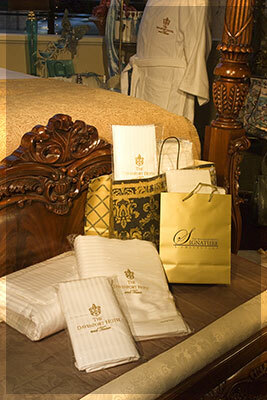 That’s right, the custom made linens, luxurious bath robes, plush bath sheets can all go home with you. Also available are soothing and sensual bath products and of course, the celebrated Davenport mattress, on which the Hotel rests their reputation on and you live comfortably ever after. When The Davenport Hotel and Tower put its name on something, it’s got to be good. You have their signature on it.